Approximately 150 companies in more than 10 countries worldwide are already conducting trials based on this technology, and there are more than 30 actual e-AI use cases underway. Renesas has now developed a new RZ/A2M microprocessor (MPU) to expand the use of e-AI solutions to high-end applications. 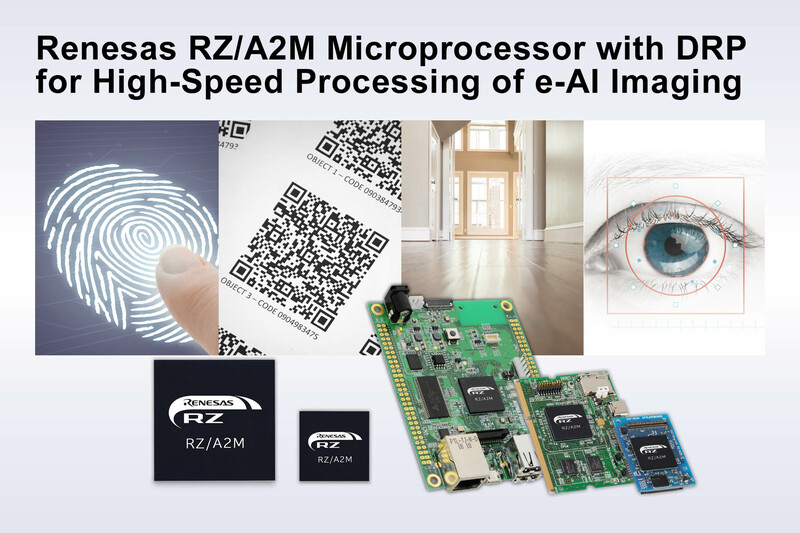 The new MPU delivers 10 times the image processing performance (Note 1) of its predecessor, the RZ/A1, and incorporates Renesas’ exclusive Dynamically Reconfigurable Processor which achieves real-time image processing at low power consumption. This allows applications incorporating embedded devices – such as smart appliances, service robots, and compact industrial machinery– to carry out image recognition employing cameras and other AI functions while maintaining low power consumption, and accelerating the realization of intelligent endpoints. Renesas already offers AI unit solutions that can detect previously invisible faults in real time by minutely analyzing oscillation waveforms from motors or machines. To accelerate the adoption of AI in the OT field, Renesas has developed the RZ/A2M with DRP, which makes possible image-based AI functionality requiring larger volumes of data and more powerful processing performance than achievable with waveform measurement and analysis. Since real-time image processing can be accomplished while consuming very little power, battery-powered devices can perform tasks such as real-time image recognition based on camera input, biometric authentication using fingerprints or iris scans, and high-speed scanning by handheld scanners. This solves several issues associated with cloud-based approaches, such as the difficulty of achieving real-time performance, assuring privacy, and maintaining security. The RZ/A2M with DRP is a new addition to the RZ/A Series lineup of MPUs equipped with large capacity on-chip RAM, which eliminates the need for external DRAM. The RZ/A Series MPUs address applications employing human-machine interface (HMI) functionality, and the RZ/A2M adds to this capability with features ideal for applications using cameras. It supports the MIPI camera interface, widely used in mobile devices, and is equipped with a DRP for high-speed image processing. Renesas has also boosted network functionality with the addition of two-channel Ethernet support, and enhanced secure functionality with an on-chip hardware encryption accelerator. These features enable safe and secure network connectivity, making the new RZ/A2M best suited for a wide range of systems employing image recognition, from home appliances to industrial machinery.